Funko boxes are bubble wrapped and air pockets used to prevent any moving. From Funko's popular 'POP!'. It stands approx. These boxes are incredibly fragile and if the box is a high priority to you we request you view the advert images uploaded. Funko boxes are bubble wrapped and air pockets used to prevent any moving. From Funko's popular 'POP!'. It stands approx. Funko Pop! Marvel 243 Thor Ragnarok Hela - New. Condition is New. Dispatched with Royal Mail 2nd Class. Marvel:Deadpool - Domino Funko Pop! Funko boxes are bubble wrapped and air pockets used to prevent any moving. It stands approx. 9 cm tall. These boxes are incredibly fragile and if the box is a high priority to you we request you view the advert images uploaded. Great Special Edition POP figure of Doctor Strange - As Ghost Rider! Great for any Marvel or Funko POP fans! Funko Pop Gold Chrome Groot Marvel Studios 10 year Anniversary Vinyl Figure(378). Condition is New. Dispatched with Royal Mail 2nd Class. Funko Pop #20 - Deadpool - Marvel - Universe - A /A . height = 95 mm. Most of our toys are given a condition grading consisting of 2 letters. The first refers to the model and the second refers to the box i.e. A/B. Funko Pop! More Funko Pop! Vinyls available from. NEW! Unopened BLACK PANTHER Pop! #273. MARVEL. Unopened Pop! Black Panther - the Movie. Chadwick Boseman. Funko Pop! 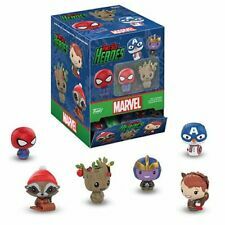 Heroes Vinyl Bobble-Head Marvel Universe Spiderman #03. Condition is New. Dispatched with Royal Mail 2nd Class. The box is in excellent condition - perfect for in the box collectors. Slowest but cheapest option. If it was sent to the wrong account, your bank can help you retrieve this. Funko Pop Vinyl Hulkbuster Vs Hulk NYCC 2018 Marvel Movie Moments Exclusive. Condition is New. Dispatched with Royal Mail 2nd Class. Slight folds on the top of the box. This Wolverine Marvel Pop! Vinyl figure stands 3-3/4 inches tall. The stylized vinyl figure of Wolverine is a bobble head and comes in a displayable window box. Funko Pop! Marvel 245 Thor Ragnarok - Heimdall - New. Condition is New. Dispatched with Royal Mail 2nd Class. Funko Pop! Marvel 243 Thor Ragnarok Hela - New Rare Collectible. Condition is New. (See photos for exact) Dispatched with Royal Mail 2nd Class (2 to 3 working days to post). From Funko. Funko No: 0. Series: Marvel:Avengers Infinity War. Character: Iron Man. Box Condition: Original (Unopened). Funko Pop Marvel Universe # 20 Deadpool Collect Them All! Vinyl Bobble-Head. Character : Deadpool. Marvel Series : Deadpool. Character Family : Marvel. Product Line : Pop. Marvel、DC Comics. Marvel Series. Th or 'Sakaaran Gard' Mystery Mini. Character:Sakaaran Gard. Movie: Thor Ragnarok. Head backwards. Funko Mystery Mini. Marvel Vs Capcom Gamora Vs Strider Exclusive POP! We will try our best to resolve the problem. Vinyl Bobble Head! The Deadpool Marvel Pop! Rendered in the stylized Pop! Vinyl manner, Deadpool looks great! Ages 5 and up. Deadpool is one of the favorite characters of all Marvel fans, and interest has increased with the release of the film. The box is in excellent condition - perfect for in the box collectors. If it was sent to the wrong account, your bank can help you retrieve this. If it was sent to the wrong account, your bank can help you retrieve this. Why Choose Us. Once issued the vote will do nothing. and give a solution before voting in the negative. Once you cast the vote we can not do anything. Tema Doctor Strange. MARVEL UNIVERSE/ FUNKO POP DEADPOOL 10 CM VINYL FIGURE #20 VW GOLF 5 BOX 4"
Tema MARVEL UNIVERSE. and give a solution before voting in the negative. Once you cast the vote we can not do anything. Tamaño 10 CM/ 4". READ WELL BEFORE YOU BUY! Once issued the vote will do nothing. Tema Marvel universe. and give a solution before voting in the negative. Once you cast the vote we can not do anything. READ WELL BEFORE YOU BUY! READ BEFORE BUYING! Once issued the vote will do nothing. FUNKO POP! Marvel Universe Spider-Man Blue & Red #03 Vinyl Figure Brand New. Condition is New. Dispatched with Royal Mail 2nd Class. 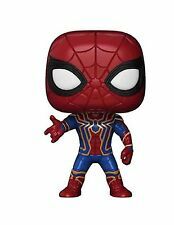 Ending Saturday at 12:18AM BST6h 31mBrand: FunkoCharacter: Spider-ManSize: 3.75"
Funko POP! "Marvel" Superheroes. #191 Black Bolt (Blue). #191 Black Bolt.